Last night, sometimes reader Melissa had one unfortunate thing happen. Her cell phone fell in the potty (Mel, I hope that you don’t mind me sharing this with my millions of readers lol). Melly’s case is a common problem among cell phone users around the world. 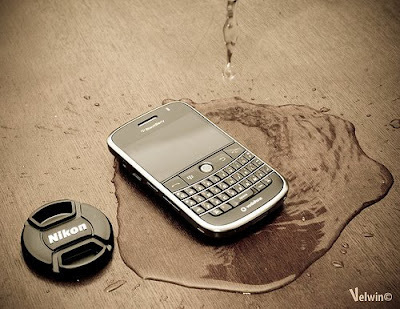 Your phone becomes drenched and you too become soaked with tears of sadness. From my days working on a consumer tech assistance service, I will say, there is a solution. So I’m bringing back Tech Tuesday with a “How do I fix my cell phone if it gets dropped in water” solution. Sometimes reader Melissa took a good first step in saving her cell. Right now her precious Blackberry is resting in a ziplocked bag (or airtight container) of rice. Score! This is said to help absorb the water. Beef jerky also works. No, really. I’m serious. Before you place it in the rice, be sure to dry out the phone first with a towel. Keep the phone in the rice or jerky mixture for the night. If you don’t believe me, visit the Geek Squad website.